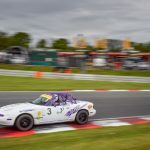 Changing conditions, car problems, 2 epic battles and a trophy defined the weekends racing at the first round of the BRSCC Mazda MX 5 Championship at Silverstone. After some of the most exciting racing seen in the Championship over the years, Ben came away with 6th and 5th placed finishes in the weekend’s 2 races. 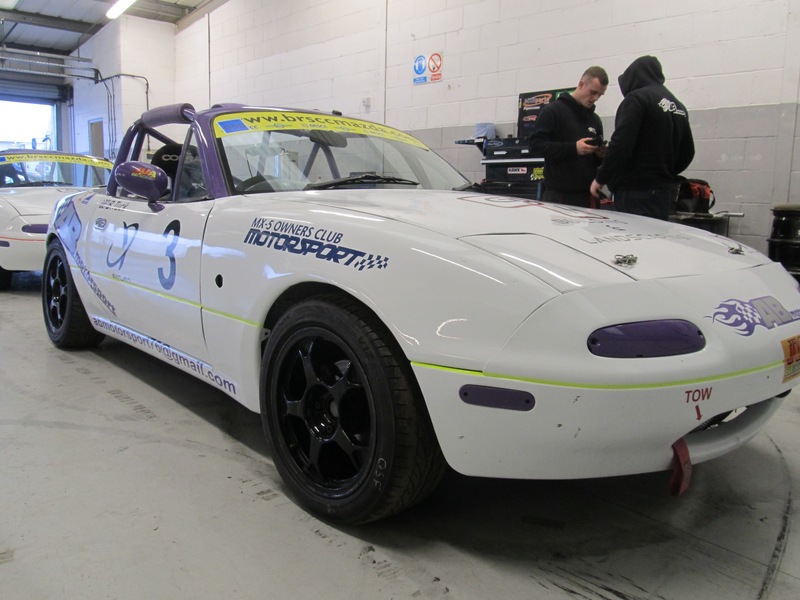 The weekend began well in the Northamptonshire drizzle during Friday testing when the AB Motorsport run Mk1 MX5 clocked up top lap times as Ben and the team dialled into the conditions. Carrying through the confidence built in his first taste of car racing at the end of 2014, Ben topped the times for his class. Saturday practice saw damp and drying conditions where the car gradually changed onto a dry set up. The change began to uncover some suspension issues with the car, with the result that Ben dropped to 3rd fastest – still impressive for a driver in his 7th ever race event. As qualifying set off, the track was dry and Ben set about getting the best out of the car. 8 laps later Ben had piloted his car to 5th in his group, resulting in a 9th place on the grid and suffering from a lack of grip due to the suspension problem. AB Motorsport put in long hours after qualifying to work on the car with the hope for an improvement for the races. On Sunday morning Ben ventured out on track with a slightly unknown car prepared to have to adjust his driving for Race 1A. After a hectic first lap where he was jostled down to 11th, Ben set about optimising his driving style for the car and began to recover taking a position every lap and finding 7th place by lap 5. 3 laps from the end Ben pounced on a mistake from the #23 car in front to take 6th by the flag. Encouraged by his recovery in Race 1A, Ben was determined to ensure that his start was better in Race 2A as he lined up on the 3rd row. As the 28 Mazdas got underway, Ben maintained his position in the face of fierce and exciting racing with a gap extending to the top 5 as his ailing car struggled for grip. On lap 5 the #76 car battling in second place went off and rejoined behind Ben sparking a race long tussle between the two. Despite the #76 car being handed a 5 second penalty to be added after the race, the pair exchanged places on a corner by corner basis as the leaders engaged in a four way fight for the lead just ahead. After 20 minutes, Ben took the flag in 5th place after perhaps his hardest fought race so far. Ben and the team took great consolation with their 5th place trophy and reflected on the steps forward they made with the car and the way in which Ben was able to adapt to get the very best result possible.